The G-Wiz of the United Kingdom and the REVA of India are one and the same electric car, big on environmental and public health though small in size. The electric cars that are called the G-Wiz in the United Kingdom and the REVA in India are so friendly to environmental and public health that they sell well as used cars. The G-Wiz belongs to history since its replacement by the G-Wiz i (REVAi) in 2008 and the Mahindra e20, REVA L-ion and REVA NXG in 2009. Mahinda Reva Electric Vehicles Private Limited considers G-Wiz a generator of minimalist carbon footprints thanks to 80 percent fewer moving parts than internal combustion engine-fueled cars. Michael Boxwell, author of The Electric Car Guide: G-Wiz, describes G-Wiz’s 90 percent efficiency with just three moving parts and its powerful acceleration without multi-ratio gearboxes. He emphasizes the ecological sense of personal transportation that emits no carbon dioxide, carbon monoxide, nitrous oxide and sulphur dioxide and uses 97 percent recyclable batteries. Pit to plug, point of power, point of use and well to wheel flourish when comparing environmental and public health impacts of alternative and conventional cars. Analyses from pit to plug and from well to wheel generate respective carbon footprints for battery recharge-time electricity and for engine diesel, gas, oil and petrol. The G-Wiz has a smaller carbon footprint than that of conventional cars, hybrids and hybrid plug-ins because of its diminutive size, limited range and restricted speed. It is a heavy quadricycle in Europe, a neighborhood electric vehicle in the United States and, per manufacturers in Bangalore, India, a small micro electric car. The key in the ignition and the shoe off the accelerator respectively jump-start the motor into immediate low speed acceleration and into instant slow speed braking. G-Wiz weights keep steady at 665 kilograms (1,466.07 pounds), with 395 kilograms (820.82 pounds) of car and with 270 kilograms (595.25 pounds) of lead acid batteries. The two-door, four-seat, 1.52-meter- (5-foot-) long, 2.59-meter- (8.5-foot-) tall G-Wiz lets two adults into the front and two children into the back, for 270-kilogram (595.25-pound) maximums. It maintains speeds of 16 kilometers (9.94 miles) per hour in stop-and-go traffic, up to 80 kilometers (49.71 miles) per hour, within a 64.37-kilometer (40-mile) range. G-Wiz owners need 9 seconds to plug into 24-volt domestic power sockets, 2.5 hours to reach 80 percent capacity and eight hours to realize 100 percent. Michael Boxwell observes that eight lead acid batteries in the G-Wiz, sold new from 2004 through 2007 in the United Kingdom, store 8 kWh of energy. Wendy Allen, environmental designer based in Ramsbury in South West England, won gold medal for Best Sustainable Garden Award: her sustainable rain garden design also showcased G-Wiz/Reva electric car as transportation mode of choice for urban dwellings. Restricted ranges, sizes and speeds prompt G-Wiz and REVA drivers to worry more about environmental and public health impacts of battery-caused pollution than about point-of-power pollution. Michael Boxwell quantifies the carbon footprints for each battery, each eight-pack and each four-year cycle at 15, 120 and 360 kilograms (33.07, 264.44 and 793.66 pounds). Four-year replacement schedules, every 80,000 kilometers (49,709,69 miles), result in eight-pack, 97 percent recyclable sets whose footprint is 4.5 grams per kilometer (0.16 ounces per mile). Melted, reformed casings supply reusable raw lead from 98 percent of United States’ recyclable lead acid batteries and 100 percent of Europe’s used lead acid batteries. Michael Boxwell tells of traversing London 20 minutes before his wife’s conventional car because of G-Wiz’s infiltrating small openings, occupying tiny spaces and perfecting speed changes. Goodbye G-Wiz: "Michael Boxwell says goodbye to his REVA G-Wiz, his first ever electric car, and takes it for a last drive." Boxwell, Michael. 29 October 2010. 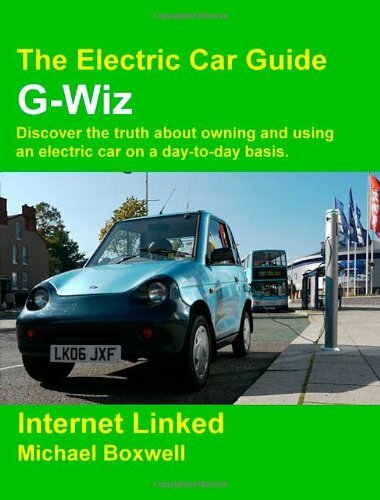 The Electric Car Guide: G-Wiz. Discover the Truth about Owning and Using an Electric Car on a Day-to-Day Basis. Coventry, England, UK: Greenstream Publishing. Boxwell, Michael. 3 August 2015. The Electric Car Guide: 2015 Edition. Discover the Truth about Owning and Using Electric Cars. Coventry, England, UK: Greenstream Publishing. Boxwell, Michael. 2 May 2016. The Electric Car Guide: 2016 Edition. Discover the Truth About Owning and Using Electric Cars. Coventry, England, UK: Greenstream Publishing. Fuller. John. 20 February 2008. “How the G-Wiz Electric Car Works.” HowStuffWorks.com. 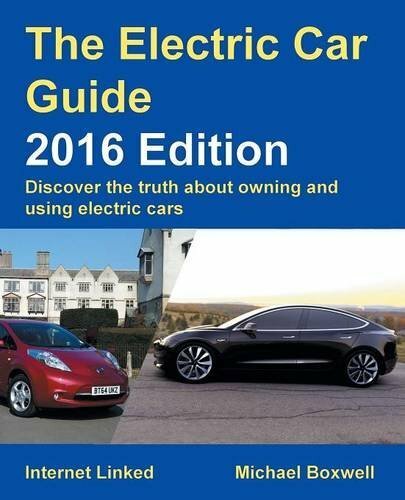 Definitive guide to owning an electric car by electric car expert and owner Michael Boxwell. Electric car expert Michael Boxwell writes from personal experience, as a previous G-Wiz owner, in his definitive guide to the G-Wiz. sandyspider, Exactly! It nevertheless is my understanding that European countries really are finessing battery recycling so that hopefully the Americas will catch up before too long. DerdriuMarriner, One thing that is not mentioned is, the large batteries for these cars are not good for the environment when the car is disposed. sandyspider, It's interesting that electric- and water-powered cars appeared to have more promising futures at the beginning of the twentieth century ... until the discovery of all of the uses of fuel. 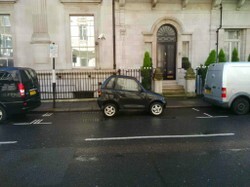 The tiny size certainly gives second thoughts to driving in the world of SUVs, trucks and vans. Have not seen too many electric cars here. Not sure if I would drive one that tiny. blackspanielgallery, Thank you for the two very astute observations. Michael Boxwell, some of whose other electric and hybrid car related books I've reviewed also on Wizzley, is in agreement with you, particularly in the updated, 2016 edition of his electric car guide. It is the fewer moving parts that must be significant. I have always questioned hybrids for the electricity used to recharge them comes from a power plant, so I still see a carbon footprint. But with fewer working parts there may well be a reduction in carbon footprint here. Electric car ownership contributes to environmental and public health by emitting no point-of-use air pollution and encouraging renewable power innovations.